One to watch: there’s some tasty inter-pro rugby that sounds good. One to Sky+: United v Sunderland could be important. One to skip: The Boat Race won’t be as eventful as last year surely? Football: Airtricity League, Sligo Rovers v Bohemians, (RTÉ Two, 7pm); Championship, Crystal Palace v Birmingham (Sky Sports 1, 5pm); Leicester v Millwall (Sky Sports 1, 7.30pm). Golf: The Trophee Hassan II, (Sky Sports 1, 11am); The Houston Open, (Sky Sports 3, 8pm). Rugby: Rabodirect Pro12, Glasgow Warriors v Munster, (TG4, 8pm); Premiership, Gloucester v Harlequins, (ESPN, 7.15pm); Championship, Doncaster Knights v Nottingham, (Sky Sports 2, 4.30pm); Super Rugby, Highlanders v Reds, (Sky Sports 1, 6.30am). Snooker: The China Open, (Eurosport, 7.30am). Tennis: The Sony Open, (Sky Sports 2, 7pm). Boxing: WBC Silver Light Heavyweight Title, Tony Bellew v Isaac Chilemba, (Sky Sports 1, 9pm). Football: Premier League, Sunderland v Manchester United, (Sky Sports 2, noon); Everton v Stoke, (ESPN, 4.30pm); Premier Soccer Saturday, (RTÉ Two, 8.30pm); npower Championship, Huddersfield v Hull City, (Sky Sports 2, 5pm); Scottish Third Division, Montrose v Rangers, (ESPN, 11.30am); La Liga, Celta Vigo v Barcelona, (Sky Sports 1, 5.15pm); Real Zaragoza v Real Madrid, (Sky Sports 1, 7pm); Serie A, Torino v Napoli, (ESPN, 8pm); Russian Premier League, Rubin Kazan v Lokomotiv Moscow, (ESPN, 9.30am). Golf: The Trophee Hassan II, (Sky Sports 1, 1300; The Houston Open, (Sky Sports 3, 5.00. 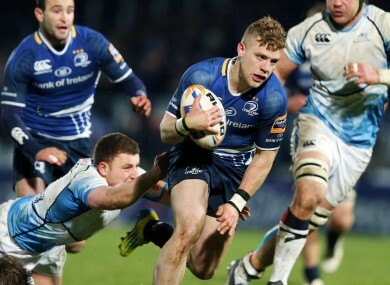 Rugby: Rabodirect Pro12, Leinster v Ulster, (RTÉ Two, BBC2, 6pm); Ulster Bank League, Lansdowne v Clontarf, (RTÉ Two, 2pm); Premiership, Northampton Saints v Leicester Tigers, (Sky Sports 1, 2.30pm); Super Rugby, Chiefs v Blues, (Sky Sports 1, 6.30am); Brumbies v Bulls, (Sky Sports 1, 8.30am); IRB Rugby Sevens, Japan Sevens, (Sky Sports 4, 6am). Cycling: The Tour of Flanders, (Eurosport, 10.45am). Football: Premier League, Aston Villa v Liverpool, (Sky Sports 1, 1pm); Scottish Premier League, St Mirren v Celtic, (Sky Sports 4, 12.30pm); La Liga, Espanyol v Real Sociedad, (Sky Sports 1, 7.00; Atletico Madrid v Valencia, (Sky Sports 1, 8pm); Ligue 1, Lyon v Sochaux, (ESPN, 7.30pm); Eredivisie, Roda JC v Ajax, (ESPN, 11.30am). Golf: The Trophee Hassan II, (Sky Sports 1, 2pm); The Houston Open, (Sky Sports 3, 6pm). Horse racing: RTÉ Racing, Fairyhouse, (RTÉ Two from 2.10pm). Motor sport: British Touring Car Championship, Brands Hatch, (ITV4, 10.45am). Rowing: The Boat Race, (BBC1, 3.25pm, Eurosport, 4pm). Rugby: Premiership, London Irish v Sale Sharks, (ESPN, 1.45pm); Championship, Bristol v Plymouth Albion, (Sky Sports 2, 4pm); IRB Sevens, Japan Sevens, (Sky Sports 1, 6am). Tennis: The Sony Open, (Sky Sports 2, 4pm).